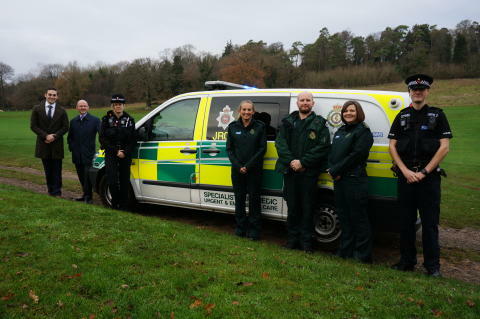 Today (Thursday, 13 December), Surrey Police and South East Coast Ambulance Service (SECAmb) have joined forces to introduce a pilot initiative in West Surrey (Guildford, Surrey Heath, Waverley, and Woking), to help when responding to people facing crisis. The Joint Response Unit (JRU) will comprise of a SECAmb Paramedic and two Police Officers working together, in a designated SECAmb vehicle. The pilot initiative will operate between 6pm to 2am Thursday evenings to Sunday mornings. Together, they will respond to calls from Surrey Police requesting ambulance attendance, or SECAmb requesting police assistance for medical calls, with the overall aim of providing a more fitting response to those facing crisis in Surrey. The pilot will take place for six months, following data that showed over 7,600 incidents had been recorded between October 2017 to October 2018, which required either service to request attendance of the other. Almost half of these incidents occurred within the West of the county. Of those instances, typically 40% presented between the hours of 6pm and 2am. During September 2018, approximately 40% of joint incidents attended were calls of a complex health and social care nature, categorised as alcohol related, assault or domestic, mental health, concern for welfare (including Section 136 of the Mental Health Act) or attempted suicide. The pilot supports the wider-Surrey Making Every Adult Matter (MEAM) project, sponsored by Surrey Police in collaboration with the Office of the Police and Crime Commissioner and Surrey County Council. “We have seen significant increase in complex cases that require the attendance of more than one emergency service for some time, and we recognised, together with SECAmb that we needed to do something innovative in these circumstances. It’s great to see the Joint Response Unit introduced in West Surrey and believe that it will deliver the same positive results that colleagues in London and Kent have seen from similar schemes. “The Joint Response Unit marks a significant milestone for the county in terms of our emergency services working more closely together. “Close collaboration is vital to the future of our blue light response in Surrey so I am delighted this important project has been launched and look forward to seeing it in action soon.